These Oreo Stuffed Red Velvet Brownies are deliciously decadent! 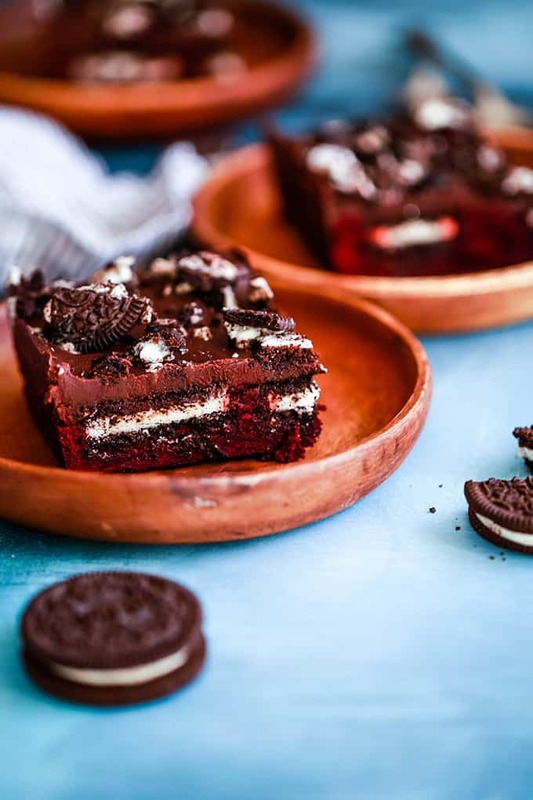 A fudgy red velvet brownie base is stuffed with Oreos and then covered with a layer of chocolate ganache and more crumbled cookies. Original content posted February 2017. Updated January 2019. So I may have texted my husband almost in tears when I had finished photographing these Oreo Stuffed Red Velvet Brownies and realized that there was no memory card in my camera. I’m thinking he was secretly glad that I was at home manning resting time for our three youngest children and he was at our 8 year old’s basketball game, thus he was unable to witness my meltdown in person. I must say I was quite proud of myself and no tears were actually shed. The show must go on right? That’s why I’ve now made two pans of these brownies in less than four days. No complaints here! These decadent Oreo Stuffed Red Velvet Brownies were an absolute hit at our impromptu Super Bowl party this past weekend. So much so that I then made them again so I could actually have photographs to share with the recipe. Crazy concept, right? I have a feeling I’ll be making them again soon as my sister-in-law could be president of the red velvet fan club and once she see’s what I’ve been up to, well, I might as well head towards the kitchen now. This dessert is a delicious collision of three of my favorite sweets. My One Bowl Chocolate Fudge Brownies, Oreos and my Microwave Chocolate Ganache. If the three are awesome on their own, together they are hands down my new favorite dessert. When you hear people raving upon first bite, you know you have a winner! 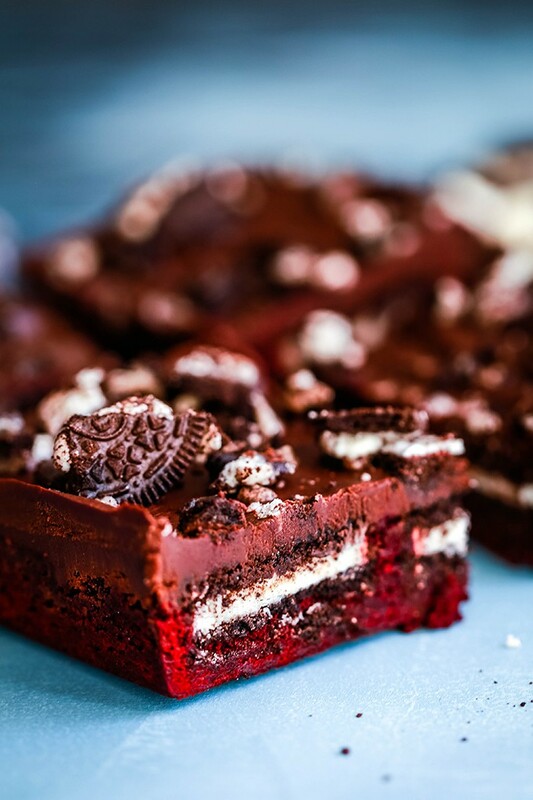 These Oreo Stuffed Red Velvet Brownies are deliciously decadent! 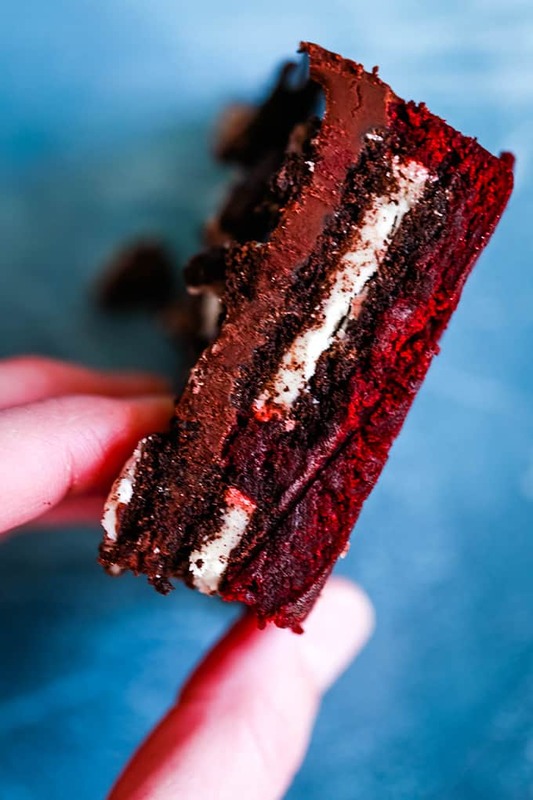 A thick, fudgy red velvet brownie base is stuffed with Oreos and then covered with a layer of chocolate ganache and even more crumbled sandwich cookies. My idea of a perfect Valentine’s Day treat. Grab a couple glasses of milk and a few brownies and cuddle up on the sofa with a movie. I’m so not high maintenance, even if my husband my argue otherwise some days. If I was a betting person, I’d guess you have all the ingredients in your kitchen for these Oreo Stuffed Red Velvet Brownies already. And the fact that you can prepare them in just 15 minutes? I think that’s argument enough for you to scrap the idea of hitting a store for a heart shaped box of candy and making brownies instead. Your Valentine will thank you, guaranteed. In a large saucepan over low heat, melt butter. Add cocoa and coffee to melted butter. 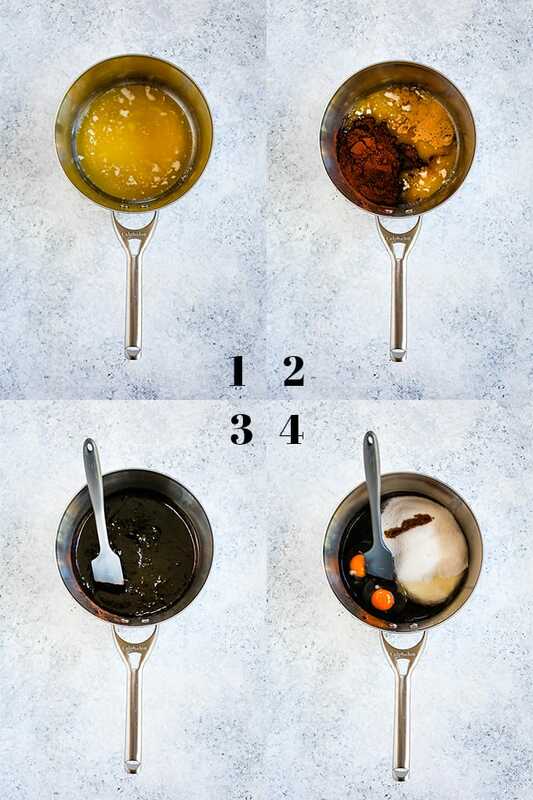 Add sugar, eggs and vanilla to saucepan. 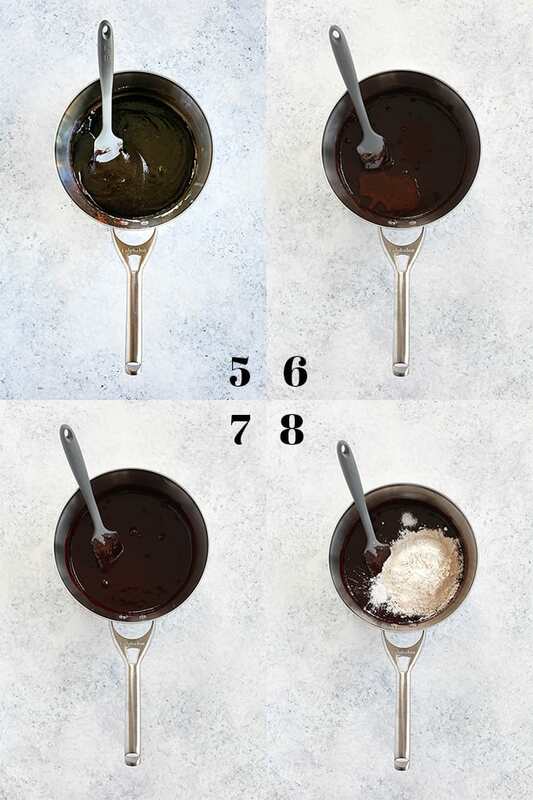 Add vinegar and food coloring to saucepan. TIP: I prefer to use gel food coloring rather than traditional food coloring as it’s more concentrated which means you don’t have to use as much of it to achieve the desired color. Add flour, baking powder and salt. 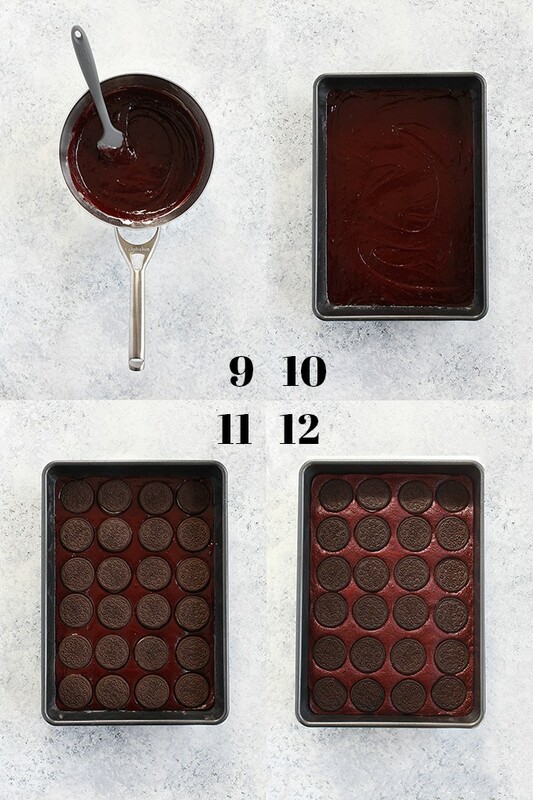 Pour batter into greased 9″ x 13″ baking pan and smooth into an even layer. Place Oreos onto batter evenly into four rows and six columns. TIP: I LOVE Oreos! I’ve used both original Oreos and the Double Stuf varieties in this recipe with equally delicious results. Bake at 350 degrees for 18-20 minutes or until just set and a toothpick inserted into the center removes cleanly. PrepareMicrowave Chocolate Ganache per recipe instructions. 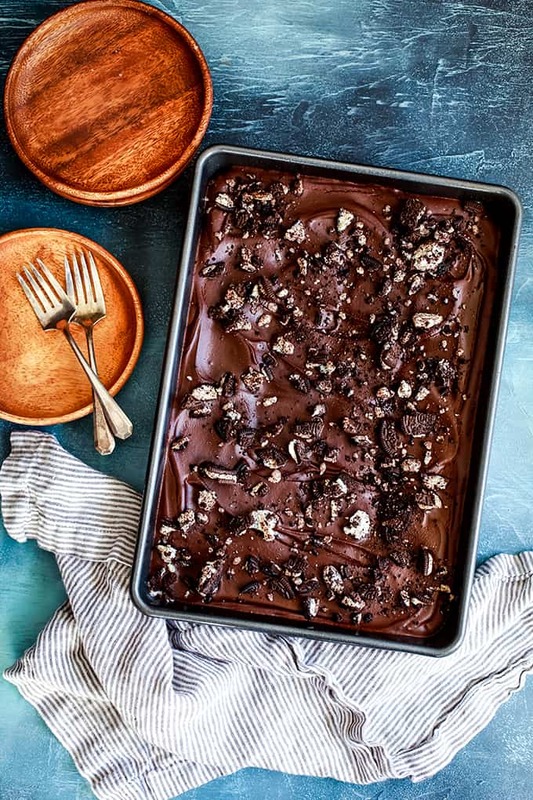 Allow brownies to cool for five minutes before covering with chocolate ganache. Garnish with crushed Oreos and refrigerate until set. 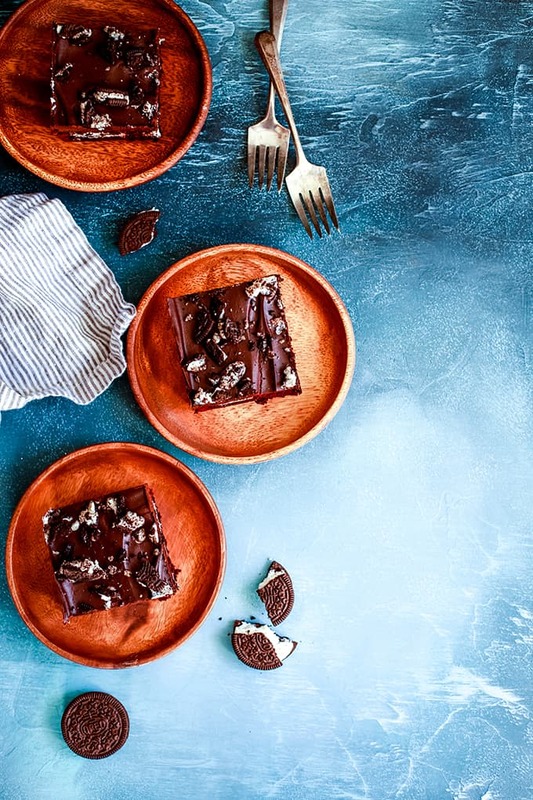 TIP: A typical package of Oreos will have approximately six cookies left over to crush for the garnish of these brownies. 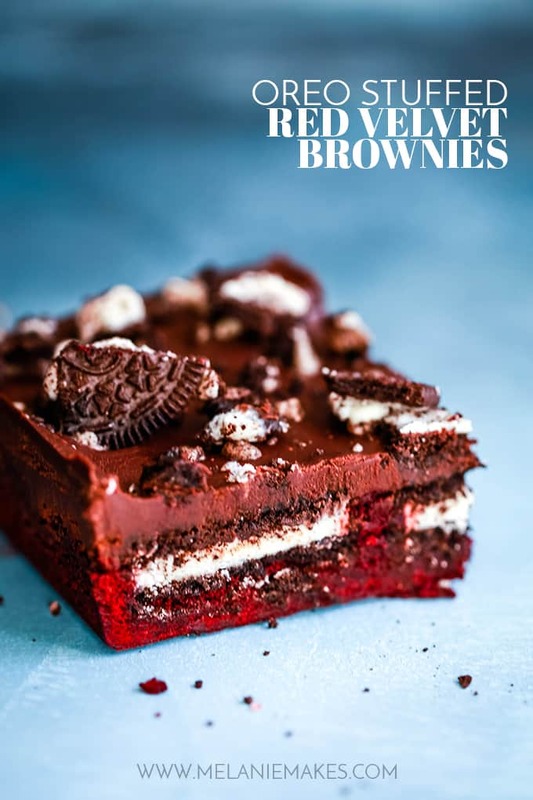 If you’ve tried these Oreo Stuffed Red Velvet Brownies or any other recipe on Melanie Makes, please let me know your thoughts in the comments below. I love hearing from you and respond to each and every comment! These Oreo Stuffed Red Velvet Brownies are deliciously decadent! 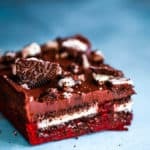 A thick, fudgy red velvet brownie base is stuffed with Oreos and then covered with a layer of chocolate ganache and even more crumbled cookies. Add cocoa and coffee to butter and stir to combine. Add sugar, eggs and vanilla and stir until well combined. Add vinegar and food coloring and stir until food coloring is completely combined. Stir in flour, baking powder and salt until just combined. Pour batter into greased 9" x 13" baking pan and smooth into an even layer. Bake for 18-20 minutes or until just set and a toothpick inserted into the center removes cleanly. TIP: I prefer to use gel food coloring rather than traditional food coloring as it's more concentrated which means you don't have to use as much of it to achieve the desired color. TIP: I LOVE Oreos! I've used both original Oreos and the Double Stuf varieties in this recipe with equally delicious results. Red velvet fans, I’ve got even more recipes you should try after you finish off a pan of these Oreo Stuffed Red Velvet Brownies. You’ll no doubt love this addictive Red Velvet Puppy Chow, decadent Red Velvet Hot Chocolate and showstopping Red Velvet Checkerboard Cake. This is really incredible! So yummy! Thanks fort he recipe! YUM!!! I love this delicious version! So hungry for this! These look delicious! Can they be cut into smaller brownie s nearly with the Oreo in the middle? These would be so great at the next garden party on Valentine's day! Hi, Ann - So if you want an Oreo in the middle, you'll want to cut them in 24 pieces. Believe me, those pieces will be big enough! I love everything about this! The ultimate treat! This is like a dream come true! I'm ready for my piece right now! If you're like me, you'll want another piece! OMG. These brownies are KILLING ME. I want a dozen! I think we'd get along famously, Chrissie! This cake is perfect to enjoy with the family on Valentine's Day! Oh my!! These look perfect for Valentine's day but I also want a slice right now with my morning coffee! LOVE the idea of having one with coffee, Regina. Genius! Oooh, so fudgy, with frosting AND Oreos??? You've hit a home run with these gorgeous brownies! Those look and sound absolutely mouth-watering, I WANT!! I haven't tried them this way, Sue, but have no doubt they'd be a hit that way! There is so much goodness in this recipe my brain can't handle it! Thank you so much, Kelly! Ahh-mazing! This is DROOL-worthy! I can't wait to have a bite! They're definitely a new favorite at our house, Jenni! Yum! Will be on the menu for valentine's. 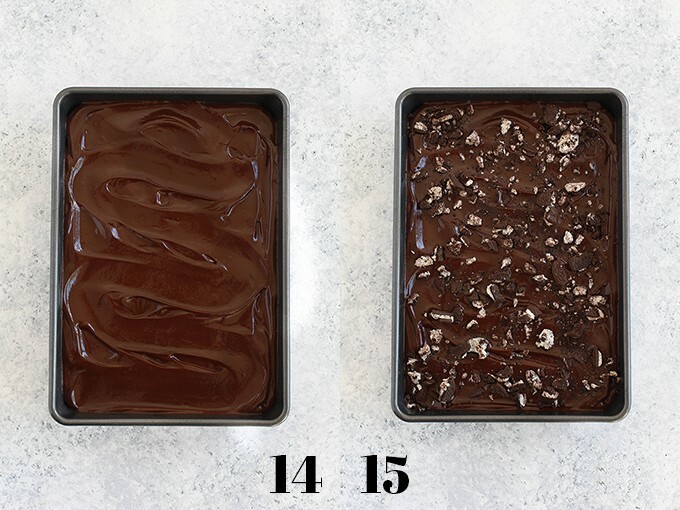 You combined so many delicious flavors in one brownie. LOVE these!! All of my favorites in one, Cathy! I love baking using oreos as an ingredient! This recipe looks amazing! Me too, Sabrina - thank you! I would have cried if that happened to me too. I did the same thing once at a soccer game, but I caught it partway through the game! So frustrating! Your brownies look amazing though and I bet your family was happy to have an extra batch! Thank you so much, Michelle! Oh no! I'm sorry you forgot the memory card, but I hope your son's game went well!